God gave man Ten Commandments. Every one of them is vital, in all ages. For only by observing them can man live a full life each week, maintain a happy marriage, and function well in his home, his job, and even in the world internationally. God Himself is the Root of the Moral Law, and perfectly reflects it. Salvation was never by the works of the Law. For even before the fall, man was to keep it out of gratitude for God’s great grace. Unfallen man kept the whole Decalogue. The Sabbath, Marriage, the Forbidden Fruit, and the Tree of Life all reveal it. When man broke God’s Law, he degenerated more and more—from the Fall to the Flood. The Patriarchs kept it, and the Prophets called man back to keep it. So, too, should we. Christ never broke it. He said He had not come to destroy but to finish building the Law, and that not one jot or tittle of it would ever fail until heaven and earth themselves pass away (Matthew 5:17–18). Also subsequently, all His Apostles taught it. So, too, did the Early Church Fathers, King Alfred, Luther, Calvin, and even the great Jurist Sir William Blackstone. It is the very basis of the United States of America, and also of every other Common Law nation in the world. True Christians Love to Keep God’s Law. They shall always do so in Heaven. But all unsaved Lawbreakers, will end up in Hell. Dr. Francis Nigel Lee is a man deeply devoted to God. His extensive research and study demonstrates the truth found in Ecclesiastes 12:13, that the fear of God and His Holy Law is what man is all about. Our society, and indeed our civilization, would greatly benefit by a better understanding of the intricate design of God for His creation. Sir William Blackstone in his Commentaries on the Laws of England said it most explicitly, when he stated: “Man considered as a creature, must necessarily be subject to the laws of his Creator, for he is entirely a dependent being.” I am happy to commend to your reading Dr. Lee’s work God’s Ten Commandments: Yesterday, Today, Forever. —Roy Moore Chief Justice, Alabama Supreme Court and President, Foundation for Moral Law, Inc. The Old Testament states, “that He might make you know that man shall not live by bread alone; but man lives by every word that proceeds from the mouth of the Lord” (Deuteronomy 8:3b, NKJV). Jesus affirmed this in the New Testament when he taught, “It is written, ‘Man shall not live by bread alone, but by every word of God’” (Luke 4:4, NKJV©). 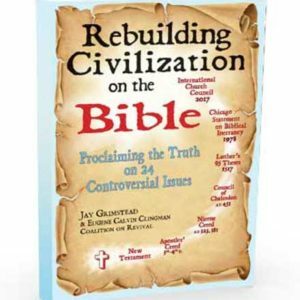 This book is about God telling all peoples to live by His Word, His Laws, in every age, in every culture, from the beginning of creation to the end of time and for all eternity. As publisher I am pleased that my friend, Dr. Francis Nigel Lee, provided his manuscript for publishing this important work. 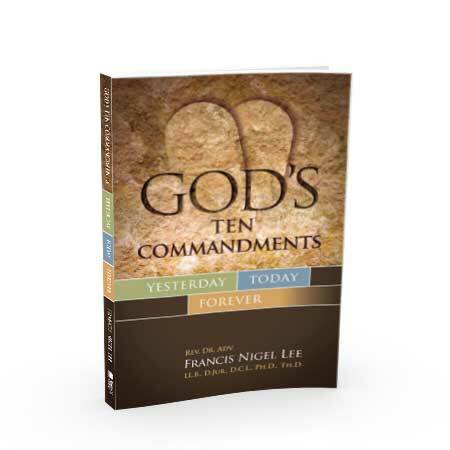 Through a scholarly rightly-dividing of the Word of Truth, with more than ample Holy Scripture references, Dr. Lee demonstrates that The Ten Commandments (which summarize all of God’s Law) are for Yesterday, and for Today, and Forever. That same weekend my wife Gail and I invited Dr. Lee to our Sunday evening home Bible class where he gave the most interesting and passionate talk about his life with Christ and the power of forgiveness. In South Africa, his father had been murdered, and after the trial and conviction, Dr. Lee had the opportunity over a period of time to witness to his father’s murderer in jail, and to see the man give his life over to Jesus Christ. 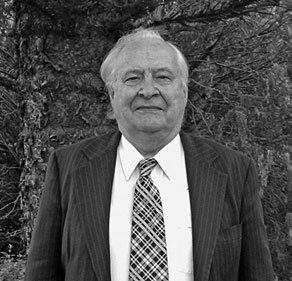 Born in England, Dr. Lee grew up in South Africa, emigrated to the U.S.A. and eventually settled permanently “down under.” He has preached well over three thousand sermons in Afrikaans and English, had well over five hundred articles published and has nearly 200 books in print, totaling well over thirty thousand pages of text. Dr. Lee has dedicated his book to former Alabama Chief Justice Roy Moore (now known as “The Ten Commandments Judge”) for his courageous stance in upholding The Ten Commandments. Judge Moore initially was thrust into the national spotlight in 1997 when he held his ground against a court order demanding that he remove a tablet of The Ten Commandments, which he had carved by hand and hung on the wall alongside his court bench in Etowah County, Alabama. Eventually this led to his placement of the famous 5280-pound Ten Commandments monument in 2001, and his stance not to cave in to pressure from those who brazenly reject God’s Law as the moral foundation of our legal system. A highly respected constitutional scholar, Judge Moore served as the Chief Justice of the Supreme Court in Alabama from 2001 until he was removed from office for daring to refuse a liberal judge’s unconstitutional court order to remove a Ten Commandments monument from the State Supreme Court building. This was a historic and heroic stand for God’s Law, The Ten Commandments. A tireless defender of individual liberties, Judge Moore has been honored by at least three states and dozens of civic organizations, receiving the “Christian Statesman of the Year” award, the “Bill of Rights” award, and the “God and Country” award. My wife, Gail, and I had a wonderful opportunity to meet Judge Roy Moore (and have our picture taken with him) at the Celebration of Justice Banquet of the Pacific Justice Institute, founded by Brad Dacus, at a gala in Orange County, California in 2005, and Judge Moore was the honoree and keynote speaker. 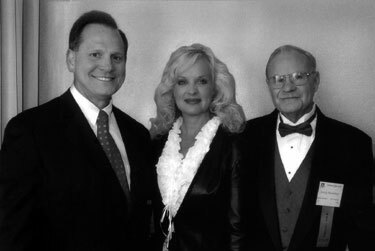 Both Dr. Nigel Lee and Judge Roy Moore are gentlemen and distinguished, faithful and courageous servants of our Lord. For more resources on the Ten Commandments, please visit www.ten-commandments.us. Dr. Francis Nigel Lee was an Advocate or Barrister (alias a Trial Lawyer) of the Supreme Court of South Africa before becoming a Minister and then pastoring congregations of the Presbyterian Church in America (PCA) in Mississippi and Florida. He was also: Professor of Philosophy at Shelton College in New Jersey; Scholar in Residence at the Christian Studies Center in Memphis, Tennessee; Academic Dean of Graham Bible College in Bristol, Tennessee; and then for twenty years Professor of Theology and Church History at the Queensland Presbyterian Theological College in Australia. Dr. Lee went to be with the Lord in 2012. We just finished reading God’s Ten Commandments, Yesterday, Today, Forever. We read it as a family and it was excellent! Great choice as one of your first publications! 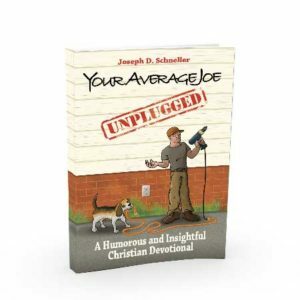 We were praying at the dinner table that it will turn into a Christian best seller. America and the world needs such a concise and readable book to open eyes to the centrality and perpetuity of God’s Law. 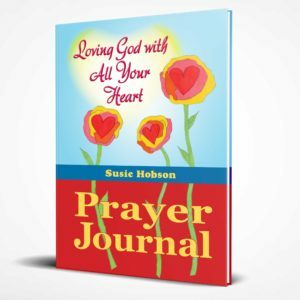 May God bless you and Nordskog Publishing! Amen! God’s Ten Commandments was highly enjoyable and informative to read….Please know that I’ve learned much from reading this book, e.g., the Dominion Charter. It has also reinforced other beliefs. One thing our country certainly needs is, in all humility, to get back to giving God the respect due Him. I am glad this book caught my attention. Also, I gladly would recommend God’s Ten Commandments to others and will be sharing my book as well. Anything that is related to the Bible I love to read along with my Bible and this book is just one of those that is ideal for study. We all know as Christians that “The Ten Commandments” are written as a pathway for us to go by. God gave these to Moses on the Mountains and they are still vital today. 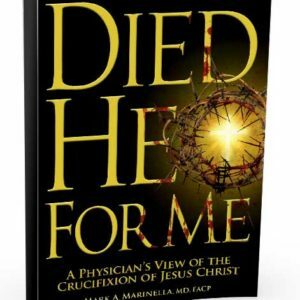 Dr. Francis Nigel Lee is a man deeply devoted to God and he did a great job with this book. He has broken it down into chapters that we can study them one at a time or do more than one. The words are backed up by Scripture and these are placed though out the book. This book would be a great family Bible study in the home and it will help teach the younger generation and also we seniors more about the Ten Commandments. Lee takes his readers on a scholarly journey through the Ten Commandments, beginning from eternity past and through eternity future. (No small task, to say the least.) His thrust behind the book seems to be that God’s Law has always been in existence because God has always existed. Simple enough. Weaving the history of the Decalogue through sin, salvation, the Sabbath, the institution of marriage, the Old Testament patriarchs and prophets, Christ’s teachings, the New Testament church, early church history, and even in the final judgment of Heaven and Hell, the author explains why God’s Law is sufficient for everything in both life and practice.